If you're new here, you may want to follow me on Instagram and Pinterest! For as long as I can remember, which is a very long time because I have a phenomenal memory, my grandmother has always said... let's practice your writing. And I am not sure if it was to make sure it was perfect or to perfect an already fantastic font. So with that being said, you will understand my excitement when I watched a close friend of mine complete a hand lettering project and it turn out perfectly. NOW I am not one to ask advice on a subject that I am sure to master if I focus in on it, so as I began to research how much hand lettering my wedding invitations would cost I figured I better get to work. Cast your mind back to when you were first learning to write and they gave you that beautiful lined paper with big spaces to show you where you upper and lower case letters should start. That is how we will begin, but it's not like you would think. Lettering is not like calligraphy, it is more like drawing as opposed to creating them by quill. For this reason, everyone should be able to create content that looks professional... simply because it is very hard to mess up. 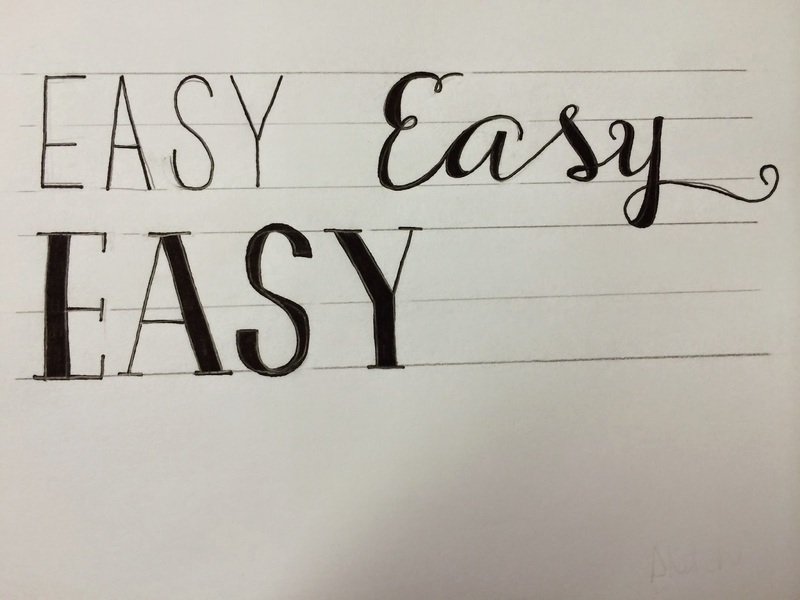 Today, I thought we would simply start with the word, "Easy" and as we get more and more practice and get comfortable with our own style of writing, we should be able to be able to create a special something for every occasion. Step 2. Select the size of paper, card or board that you wish to work with for this project. Step 3. Select the font(s) on the computer that are best suited for your work, I selected... 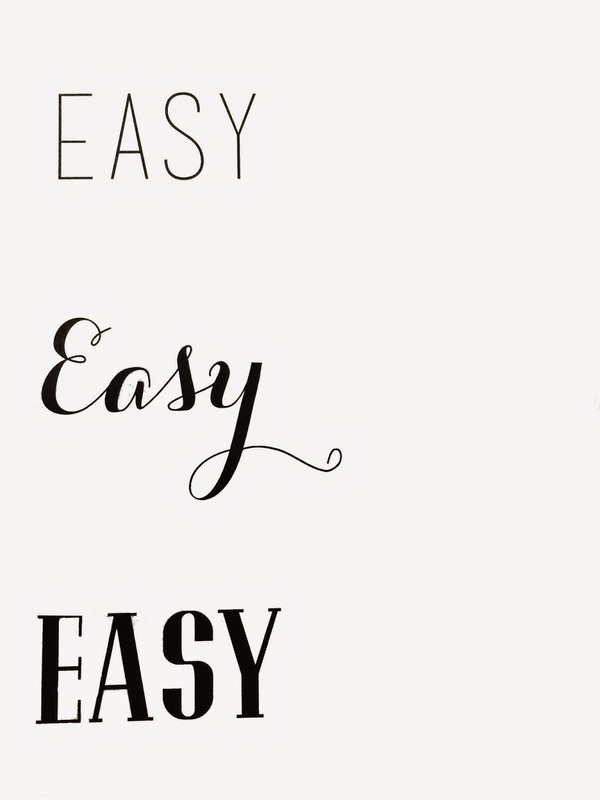 Basic Title Font, Carolyna Pro Black and Pottery Barn. Step 4. Draw your grid lines (I roughly start with a baseline, upon which the letters sit, an x line, upon which the height of the body that the lowercase letters sit and the cap height, self explanatory but... where the capital letters hit) and begin sketching the fonts as shown below. Don't be afraid to use your eraser, this is the best part and main reason for sketching the work first. Step 5. Trace over your sketch with your calligraphy pens or black markers, don't be disheartened if it doesn't come out perfect the first time you try! Feel happy because practice makes perfect. Sit and find your style, try and try again. Plus, it looks better than if you just scribbled it down, now doesn't it? Step 6. Erase your pencil marks and start again. Remember to not give up, this is a fun way to keep the hand written word alive! I would love to know how this worked for you and if you have any great tips / what you used your hand lettering for! Keep me posted!